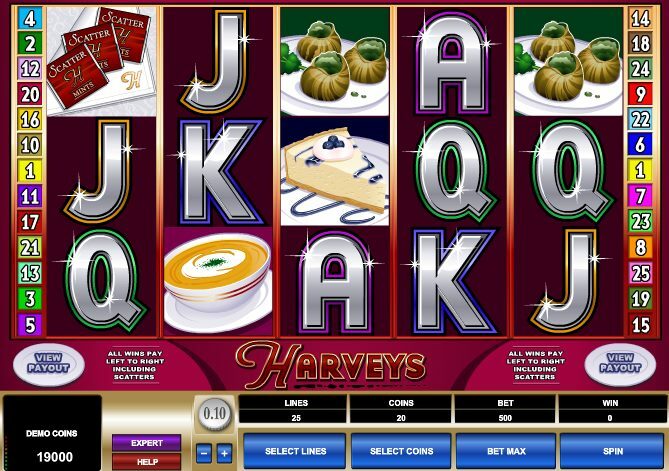 If you like the finer things in life, and indeed The Finer Reels in Life - Microgaming's online slot set around a posh restaurant complete with champers, choccies and cigars - you should get a kick from Microgaming's slot game, Harveys, set in a high-end eaterie. The burgundy color scheme has been borrowed from The Finer Reels…., obviously a sign that you're in a high-end joint here. 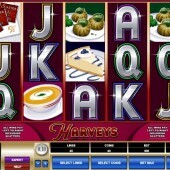 The fact you get garlic-stuffed snails (yuck) also proves this slot's upper-class pretensions, with the reels packed with snails, champagne, lobster, a tasty soup, a yummy cheesecake, and after-dinner mints with the Harveys name emblazoned across them. Meanwhile, there’s a nice ambiance of chattering diners and clinking glasses in the background on this 5 reel, 25 pay-line slot. The familiar poker symbols make up the numbers at this top table, and with spins from just $0.01, everyone's invited to take their seat. As with most Microgaming slots there are some nice little animations whenever you hit a winning combo, with Harvey (acting Wild) himself busting some moves on the reels when he forms a combo. Harvey replaces all regular symbols other than the Scatters, and 2,000 coins can be bagged when hitting five Wilds across the reels. If you’ve stuffed yourself with snails (yuck) and lobster (yum) you’ll want a nice wafer-thin mint, and at least two across the reels bags you a nice little win. Five Mints awards a win of 100x your total line bet. However, it’s the Champagne icon that will bag you free spins when hitting them on reels 2 and 4 at the same time. It’s a bit tricky to hit those two reels simultaneously but if you do, a nice 30 spins will be yours. Not only that, but you can hit a potential 25x multiplier with those spins, and spins can be re-triggered. If free spins are your thang you’ll like this slot a lot. The bonus round may be tough to hit, but once you do you can start counting those pounds or dollars. As for finding more foodie heaven on the slots, look out for Betsoft Gaming’s great 3D food-themed slot set in a Japanese restaurant, Sushi Bar.